ATTENTION, Anastasians!!! 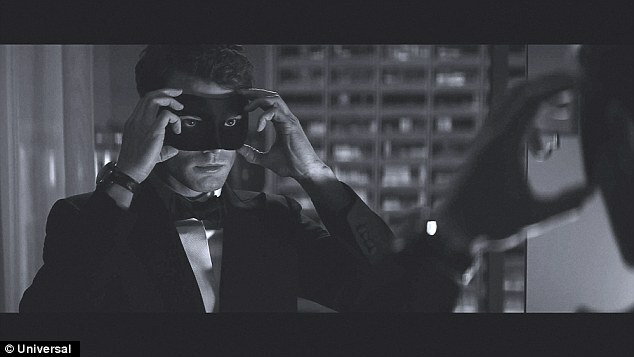 Big news about the Big Fifty Shades Film Sequel next spring: Fifty Shades Darker (set for a Feb 10, 2017 release) is filming in Vancouver AS WE SPEAK, and a sneak-peek trailer is now available, according to Heavy.com. Word on the street---er, from Heavy.com---is that Kim Basinger is signed to play Elena ("Mrs. Robinson") Lincoln in Fifty Shades Darker, with Bella Heathcoate playing ex-Christian submissive (and current Ana-stalker) Leila Williams. But First Things First: Heavy.com reports that during a scene filmed on March 16th, Christian (okay: Jamie Dornan) poured some red wine that he and Anastasia (Dakota Johnson) talked over, proving once again that wine is a BIG part of this movie and book series. Care to join in? Try a glass of Red Satin or White Silk today! Alas, lovely Anastasians!!! Word holds that "Fifty Shades Darker"--the sequel to last year's smash "Fifty Shades of Grey" film--won't be released in theaters until NEXT Valentine's Day, which really throws a kink into a girl's V-Day weekend plans this year. Christian and Ana, taking a year off. 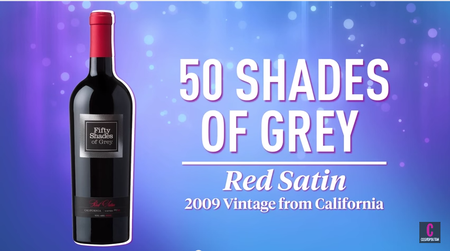 Never fear, dears: IBT.com has come to the rescue with a compilation of deliciously decadent, Fifty Shades of Grey-themed gifts guaranteed to give their recipients a very good time this Valentine's Day, featuring Fifty Shades Of Grey wine in both red and white (perhaps in an "I Don't Do Vanilla" wineglass?). Fine wine connoisseur Tom Leykis clinks a few glasses with Mark Beaman and Fifty Shades of Grey Film Producer Dana Brunetti in his Tasting Room podcast. Beaman recounts the creative process behind the unique blends of Fifty Shades of Grey wines, and reveals how Petite Sirah adds a snap of "wildness" to the Red Satin's smooth flavor. Leykis praises the complexity of both White Silk and Red Satin (while saving room for the 100% Petite Sirah Beaman brought him to sample later) and gets Beaman and Brunetti to dish about tasting wine in a hotel room with E L James (apparently spit cups were provided, but--spoiler alert!--none were used!). Beaman also provides a colorful and insightful history of Mendocino Winery and the Central Valley, spotlighting its wealth of varietals. Beaman and Brunetti announce the Fifty Shades line's arrival in the U.K. and Europe (!! ), and their hope that demand for the wines will continue far beyond the release of the next two films. 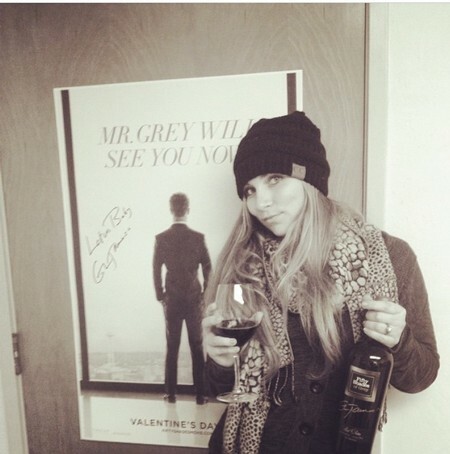 Fifty Shades of Grey Wine is inspired by the seductive relationship between Anastasia Steele and Christian Grey in the hit series Fifty Shades of Grey. The collection includes Red Satin and White Silk, sure to send your taste buds on a thrilling adventure. Personally crafted by world famous author E L James, the Fifty Shades of Grey Wine Collection is a perfect blend of naughty and nice. Cosmopolitan magazine assembled a blind (not blindfolded, alas) panel of wine experts to sample several film and television-linked wines, and express their thoughts via YouTube. The verdict? Watch us get a resounding thumb's up, here! 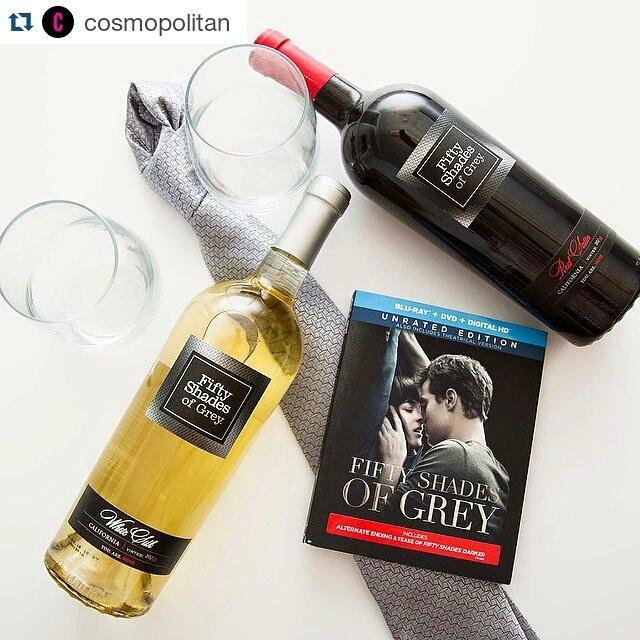 The Fifty Shades of Grey Digital Download is set to release on May 1st, and Fifty Shades of Grey Wine will be celebrating with a live-Tweeted viewing and wine tasting party! Follow Us... To Social Media. Join Angelica on Twitter for a full-day event that promises to be lots of fun. 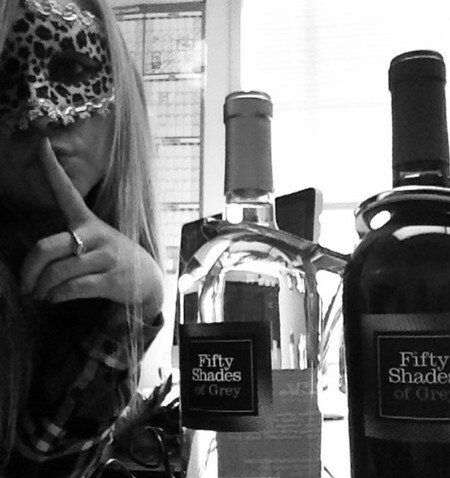 "I can't wait to see the movie from the comfort of my own home, wearing my pjs, with a glass of #FiftyShadesWine in my hand," writes Angelica. 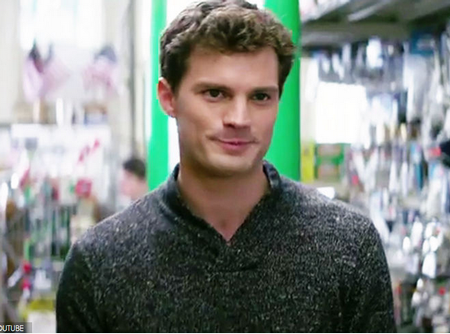 "Only thing that would make it better is if Mr. Grey was there himself! I hope to talk to my tweeps on May 1st! #FSGDigitalRelease and I will find you! Drink with me and tell me your favorite scenes! I'll be tweeting you! Laters, Baby!" Fifty Shades of Grey lovers rejoice: Starting May 1, the movie will be available in DVD form to enjoy with your evening glass of wine. Two hours (!!) of unrated bonus features beg the question we all want answered, and ELLE magazine asks: Will we finally see ALL of Jamie Dornan??? "Do these pants come in a larger size?"